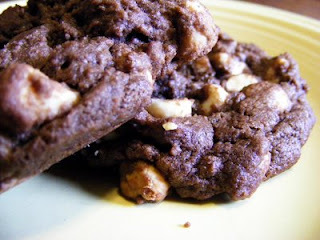 Okay I know I have had one mean sweet tooth this week but these cookies are worth all the extra calories and cavities! Don't bake these cookies too long or they will become dry and not too tasty, I like them chewy. I kept taking them out of the oven because I was afraid I would over bake them. One pan did over bake but they are still good dipped in hot coffee. This is What's Cookin on Beaty's Creek today. Cream butter and sugar together, once it is light and fluffy add your eggs, and vanilla, beat in. Now add your cocoa, flour, salt, and baking soda, mix just until incorporated well. If you over mix cookie dough the cookies will be tough. Now is the time to add your chips and almonds, I stir mine in by hand. Drop by the tablespoon on a parchment lined cookie sheets and bake at 350' for 9-11 minutes. Like I said keep an eye on them.